Born on March 14th, 1933 in Chicago, Illinois, Quincy Delightt Jones, Jr. is perhaps the most accomplished man in the entertainment industry. With his long career spanning over six decades and encompassing the roles of record and television producer, composer, arranger, conductor, instrumentalist, record company executive, film producer, magazine and radio founder, multi-media mogul and philanthropist. He has been nominated for 79 Grammy Awards and won a record 27 Grammys, including the Grammy Living Legend Award. In 1968, Quincy Jones and Bob Russell became the first African American songwriters to be nominated for an Oscar for ”Best Original Song” ( ”The Eyes of Love” from the soundtrack of the 1967 film ”Banning”). Moreover, again in 1968, Quincy was the first African-American to be nominated twice for an Oscar for ”Best Original Score” for his outstanding contribution to the score of the 1967 drama ”In Cold Blood.” He is mostly famous for his work with Michael Jackson, Stevie Wonder, Frank Sinatra, Aaliyah, Will Smith and Ray Charles. Quincy Jones was the first black artist to win the Jean Hersholt Humanitarian Award in 1995 and he was inducted into the Rock & Roll Hall of Fame in 2013. 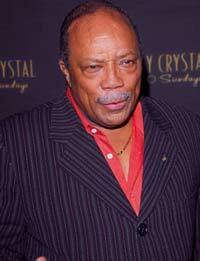 He published his autobiography Q: The Autobiography of Quincy Jones in 2001. Born to Sarah Frances and Quincy Delightt Jones, Sr., he moved with his family in Bremerton, Washington when he was ten years old and he attended Garfield High School in Seattle. When he was fourteen, he began studying the trumpet and played with Ray Charles at the Elks Club on Madison Street in Seattle; he considers Ray Charles an early influence towards developing his musical career. In the early 1950’s, he toured with Lionel Hampton as an arranger and trumpeter. Afterwards, he moved to New York City, where he arranged songs for various artists, including Count Basie, Dinah Washington, Gene Krupa, Duke Ellington and Ray Charles. In 1956, he toured with the Dizzie Gillespie band in South America and the Middle East and when he returned to the U.S., he began his recording career as the leader of his own band. He soon became one of the most famous producers in the world and in 1980 he created his own record label, Qwest. In 2006, he tested his DNA for the PBS TV program ”African American Lives” and discovered that he is of Tikar descent (from an area in Cameroon which is renowned for its music) on his mother’s side. He is one of the founders of the Institute for Black American Music. Quincy Jones has been married three times, he divorced from his third wife, actress Peggy Lipton in 1990, he had relationships with Carol Reynolds and Nastassja Kinski and he has seven children.